In May 1951, the Festival of Britain opened in London (and Glasgow). It was a national design exhibition intended to help the country recover its spirits after the deprivations of the war years. Although the festival only lasted a matter of months and nearly everything came down in 1952 (only Royal Festival Hall remains), the designs for its structures (such as the Dome of Discovery) were very influential. The government had appointed architect Hugh Casson (1910-99) as the festival's Director of Architecture. He brought together a group of young architects and engineers who injected a spirit of optimism and futurity into the structures on the principal site, London's South Bank. The luminescent cigar-shaped mast called Skylon, engineered by Felix Samuely (1902-59), particularly impressed Hunt, and it was this that spurred him to seek employment with FJ Samuely & Partners, who had an office in Hamilton Place in Mayfair, London. Samuely was in the United States at the time, so it was structural engineer Frank Newby (1926-2001) who interviewed Hunt and offered him a job. Newby later became a prominent figure at the Architectural Association in London and is well known for the design of tensile structures, such as the Snowdon Aviary at London Zoo. This was a turning point in Hunt's early career. He thrived in the free-spirited atmosphere Samuely cultivated, and later said that it was during his seven years at the firm that he learned the principal skills that would serve him throughout his professional life. Here, engineers were encouraged to collaborate with architects. New materials such as extruded aluminium and plywood were becoming available, as well as new construction techniques, both influenced by industrial processes developed during the war. The most significant project Hunt worked on at this time was the United States Embassy building in Grosvenor Square, London. He worked on the precast concrete structure for the upper floors. The building was designed by Finnish architect Eero Saarinen (1910-61), a Modernist. The Modern Movement produced functional, decoration-free buildings that explored new technologies but also were meant to do some social good. Hunt also worked on lightweight composite timber and steel structures for various school buildings in Staffordshire. During this period, Hunt married Patricia Daniels, who worked for the Arts Council and became a photographer. They moved into 39 Gloucester Crescent, London. Later they would have two children: Julian born in 1959, who became an architect and furniture maker, and Polly, who was born in 1961 and became a textile specialist. Meanwhile, Hunt had begun to explore what was to become his other lifelong passion after structural engineering  industrial design. In 1959, he entered the Cantu International Furniture Design competition in Italy. His entry received an honorable mention and, buoyed up by this success, Hunt left FJ Samuely & Partners to join the design firm founded in 1956 by Terence Conran (1931-). Hunt joined as a designer but only stayed six months, as he fell out with one of Conran's two other partners. From 1960-62, Hunt was in-house engineer for the firm of architects that became Hancock Associates. He specialised in timber roof structures, such as the one he designed for the synagogue at Carmel College, Oxfordshire. Interior design work on the then-new Shell Centre on London's South Bank brought him into contact with Hugh Casson and Margaret Macdonald who were lead designers for the project. 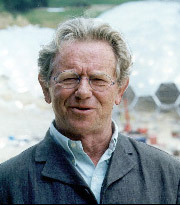 Contact with the Cassons led him to a close association with the Royal College of Art, where he lectured in the newly-founded architecture course. This chapter in Hunt's life saw him gaining ever more authority in the set of skills and interests that defined his vision. He was adept at the analysis of lightweight structures; his experience in industrial design helped him devise engineering solutions that used industrially-based processes. The 1960s were opening up before him  a time of self expression and limitless optimism. And Hunt's next big adventure had his own name on it: Anthony Hunt Associates.